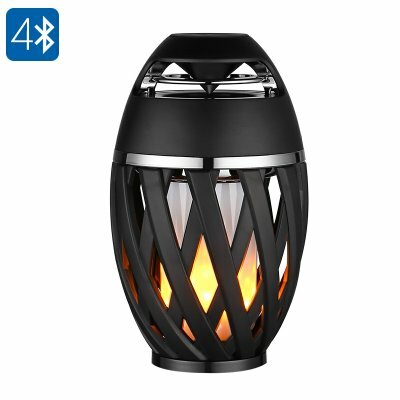 Successfully Added Bluetooth Speaker - Yellow LED Light, Bonfire Light Effect, Bluetooth 4.2, 10m Range, 2000mAh Battery to your Shopping Cart. By supporting Bluetooth 4.2, you’ll be treated with ultra-fast transmission speeds. It allows you to enjoy your favorite songs from your smartphone music library without experiencing any delay. Simply pair it with your tablet, PC, or cell phone and you’ll be all set to enjoy those all time classics. With its 5W speaker, this mood light produces high-quality audio. It comes with a large 2000mAh cell thanks to which you’re able to use it for up to 2 hours in a row. This provides you with enough juice to get through a cozy evening together with your friends or loved ones without needing to recharge. This beautiful wireless speaker features a simple to use design. It allows you to easily adjust the volume and switch in between songs with the press of a button. Additionally, you’ll be able to manually switch the mood light on or off. Thanks to this, you won’t necessarily have to turn on the lamp while listening to music. With its 10m Bluetooth range, this wireless speaker brings along great mobility. You’ll be able to walk through the room with your phone in your pocket without disturbing your audio signal. Whether you use it at home or outside, this cool gadget provides you with a great way to enjoy the songs you love most.